When Leonardo da Vinci sketched out an impossible invention, fifteenth-century scholars probably put him down. Forget it, Leon. If machines could fly, we'd know about it. The English Academy of Science laughed at Benjamin Franklin when he re-ported his discovery of the lightning rod, and the Academy refused to- publish his report. Major newspapers ignored the historic 1903 flight of the Wright brothers airplane because Scientific American suggested the flight was a hoax, and for five years officials in Washington, D.C. did not believe that the heavier-than-air machine had flown. Perhaps in the 21st century the following inventions will be standard science, and a history student may wonder why 20th-century pundits disregarded them. This class of inventions could wipe out oil crises and help solve environmental problems. More commonly called free energy or fuel-less electric generators, they put out more power than goes into them from any previously recognized source. No batteries, no fuel tank and no link with a wall socket. Instead, they tap an invisible source of power. Such unorthodox clean energy-producing devices exist today and were built as far back as the l9thcentury. Forget the Rube Goldberg mechanical perpetual motion contraptions; they had-to stop eventually. In contrast, new solid-state (no moving parts) energy-converters are said to draw from an energy field in surrounding space. This-source of abundant power is known by physicists as the zero-point quantum fluctuations of vacuum space. Zero-point refers to the fact that even at at temperature at which heat movement in molecules stops cold, zero degrees Kelvin,there is still a jiggling movement, said to be from inter-dimensional fluctuations or cosmic energy. Magnetism and vortexian or spin-upon-a-spin motions seem to line up these random fluctuations of space and put them to work,as in the Searl Effect (Atlantis Rising, first issue). Inventors give various names to their space-energy converters. In the 1930s a scientist in Utah, T. Henry Moray, invented a Radiant Energy device powered from the sea of energy in which the earth floats. This sea that surrounds us, Moray said, is packed with rays which constantly pierce the earth from all directions,perhaps from countless galaxies. Converting this cosmic background radiation into a strange cold form of electricity, his device lit incandescent bulbs,heated a flat iron and ran a motor. His sons say he was thanked with bullets and other harassments, but that's another story. The inventor of AC (alternating current) electrical generating and transmission systems, the genius Nikola Tesla (1857-1943), was said to have run a Pierce-Arrow car on a free energy device in the 1930s. Although that's-difficult to document now, we have his word that it's possible. It is a mere question of time when men will succeed in attaching their machinery to the very wheelwork of nature, said Tesla. It may have been done before Tesla's time. Among the free energy inventions-of John Worrell Keely (1827-1898) is the Hydro Pneumonia Pulsating Vacuo motor that used cavitation (implosion) of water. Although Keely reached an advanced understanding of the science of vibrations, he failed to develop machines which other people could operate. Progress continues from other directions, a company in Georgia is selling water cavitation devices that range from 110 per cent to300 per cent efficient. Up in Vancouver, Canada, Tesla researcher John Hutchison says he has a feel for the natural flows of a subtle primal energy. In the spring of 1995 he showed his latest invention to the author and a mechanical engineer. The Hutchison Converter involves crystalline materials and the principle of electrical resonance. He twirls a few knobs to tune it, and the energy flow is amplified until it runs a one-inch diameter Radio Shack motor. The whirring of a small propeller isn't too impressive until you remember that there are no batteries and the device runs for days at a time. The garage inventors come from many backgrounds. Wing ate Lambertson Ph.D. of Florida, former executive director of Kentucky's science and technology commission, invented a device which converts the space energy fluctuations into electricity which lights a row of lamps. This dignified former professor took around about route to the free-energy scene. In the mid-1960s he read There Is a River by Thomas Sugree, who writes about the destruction of Atlantis through misuse of a crystal energy collector. Lambertson's psychic friend later offered to collaborate on replicating the first Atlantean energy converter, but Lambertson eventually turned to his own knowledge of ceramics and metals to develop an energy converter. Neither his nor other known zero-point energy conversion methods of today are based on the first Atlantean crystal method,because the researchers found better methods. Also, the concept of a central power station providing electric power to a nation is obsolete, says Dr. Lambertson. Small energy converters will follow the path of the personal-converter. In Japan, cold fusion is called New Hydrogen Energy, and that oil-dependent nation welcomes successful experiments. In contrast, two pioneering experimenters were hounded out of North America. David Lewis described this-scene as Heavy Watergate in Atlantis Rising, issue two. Update: A successful experiment was served up in Monte Carlo in April, at the Fifth International Conference on Cold Fusion. Clean Energy Technologies Inc. of Florida demonstrated a cold fusion cell with energy output as much as ten times more than input. Other companies are also gambling on this new source of heat energy which could drive electric generators. What exactly causes atomic nuclei to fuse, and release energy, without extreme high temperatures and pressures? A Romanian physicist writing in Infinite Energy magazine, Dr. Peter Gluck, wonders if it could be only partly catalytic nuclear effect, and partly a catalytic quantum effect providing the capture of the zero-point energy, The ubiquitous z-p energy. Puharich reportedly drove his mobile home using only water as fuel for several hundred thousand kilometers in trips across North America. In a high Mexican mountain pass he had to make do with snow for fuel. Splitting water molecules as needed in a vehicle is more revolutionary than the hydrogen-powered-systems with which every large auto manufacturer has dallied. With the on-demand system, you don't need to carry a tank full of hydrogen fuel which could be a potential bomb. Another inventor who successfully made fuel out of water on the spot was chelate Francisco Pacheco of New Jersey. The Pacheco Bi-Polar Auto electric Hydrogen Generator (U.S. Patent No. 5,089,107) separated hydrogen from seawater as needed. A pioneer in breaking down water into hydrogen and oxygen without heat or-ordinary electricity, John Worrell Keely reportedly performed feats which20th-century science is unable to duplicate. He worked with sound and other vibrations to set machines into motion. To liberate energy in molecules of water, Keely poured a quart of water into a cylinder where tuning forks vibrated at the exact frequency to liberate the energy. Does this mean he broke apart the water molecules and liberated hydrogen, or did he free a more primal form of energy? The records which could answer such questions are lost. However, a century later, Keely is being vindicated. One scientist recently discovered that-Keely was correct in predicting the exact frequency which would burst apart a water molecule. Keely understood atoms to be intricate vibratory phenomena. Look, Mom Earth, no power lines! Tesla may have wanted to voice such a boast, but it didn't turn out that way;the world is crisscrossed with transmission lines for the electrical power grid. His invention for sending electrical power wirelessly wasn't too popular on Wall Street. Before the power brokers figured out what he was up to, Tesla built a tower-topped laboratory near what is now Colorado Springs. He filled the mountain air with thunderous man-made lightning bolts and pounded the earth with electrical oscillations as he tested ideas about electrical resonance. Then here turned to New York to build Wardenclyffe, a complex wooden tower on Long Island from which he planned to send both communications and power wirelessly. When banker J. Pierpont Morgan realized Tesla could make it possible for anyone to stick an antenna in the ground anywhere and get electrical power, the banker cut off the inventor's funding and blocked other financial deals that Tesla tried to make. Wardenclyffe tower was torn down and sold for scrap. In recent years, scientists such as James Corum Ph.D. have learned that Tesla did successfully test a wireless system in Colorado. For example, Tesla knew specific frequencies associated with the earth-ionosphere waveguide, knowledge he could not have had in the nineteenth century unless he had sent electrical oscillations wirelessly. In 1923 Townsend T. Brown's simple flying discs demonstrated a connection between electricity and gravitation. Working along these lines for twenty-eight more years, Brown patented (U.S. Patents 2,949,550, 3,018,394 and others) an electrostatic propulsion method. Starting with two-feet-in-diameter suspended discs flying around a pole at seventeen feet per second, he increased the size by a third, and the discs flew so fast that the results were highly classified,said an international aviation magazine in 1956. Before the end of his life Brown had apparatus that could lift itself directly when electricity was applied. He died in 1985. The bottom line: if electrogravitics is developed, we could have an electric spacecraft technology which does not obey known electromagnetic principles. The craft would thrust in any direction, without moving engine parts. No gears,shafts, propellers or wheels. Coupling effects between electricity or magnetism and gravity are shown by other experimenters, including David Hamel of Ontario and Floyd Sparky Sweet of California. At a 1981 symposium in Toronto, Rudolf Zinsser of Germany demonstrated a device (U.S. Patent 4,085,384) that propelled itself, according to credible witnesses such as professional engineer George Hathaway. Zinsser claimed his specifically shaped pulses of electromagnetic waves altered the local gravitational field. 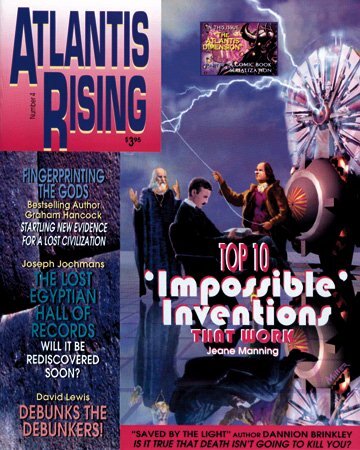 Read the first issue of Atlantis Rising for a fascinating anti-gravity story,John Searle's levity disk generator. Changing atomic elements or making elements appear mysteriously? It sounds like impossible alchemy, but experimenters recently did this, without Big Science particle accelerators. These scientists learned from a meta physician,Walter Russell (1871-1963). During vivid spiritual experiences, Russell had seen everything in the universe, from the atom to outer space, being formed by an invisible background geometry. Russell not only portrayed his visions in paintings, he also learned science. He was so far ahead that in 1926 he predicted tritium, deuterium, neptunium, plutonium and other elements. Recently, professional engineers Ron Kovac and Toby Grotz of Colorado, with help from Dr. Tim Binder, repeated Russell's 1927 work, which was verified at the time by Westinghouse Laboratories. Russell found a novel way to change the ratio of hydrogen to oxygen in water vapor inside a sealed quartz tube, or to change the vapor to completely different elements. Their conclusion agrees with Russell: the geometry of motion in space is important in atomic transmutation. Kovac shorthands that idea to geometry of space-bending. These modern shape-shifters speak of Russell's feats such as prolate oroblate the oxygen nucleus into nitrogen or hydrogen or vice versa. To change nuclei, they change the shape of a magnetic field. Although they used expensive-analyzing equipment, it is basically tabletop science. No atom-smashing-cyclotron needed; just a gentle nudge using the right frequencies. Focus and un-focus light-motion, create a vortex and control it. Cold fusion researchers are also running across strange elements popping up in their own electrified brews. No one is proposing to make gold and upset world currencies, but some experimenters aim to clean up radioactive waste by their novel processes. As Wilhelm Reich, M.D., (1897-1957) moved from Europe to Scandinavia to America, he left a trail of angry experts in every field he explored, from-psychiatry to politics to sexology, biology, microscopy and cancer research. His work all led toward one unifying discovery, a mass-free pulsating life-force-energy he named orgone, because he discovered it in living organisms before finding that it also permeates earth's atmosphere. Reich's life ended in prison after prolonged conflict with the U.S. Food and Drug Administration. His books and papers were burned by federal officials because the FDA had gathered a case against use of his orgone accumulator for therapy. The accumulator is a box made of layered organic and inorganic-materials; experiments with it show anomalous results. An unusual temperature rise inside the accumulator indicates limitations of the second law of thermodynamics. 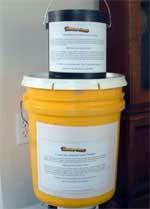 Whether or not concentrated orgone can help with health problems, the accumulator does defy standard science. In 1952 Wilhelm Reich invented a method of rainmaking that doesn't involve cloud seeding with chemicals. Cloud busting, otherwise known as etheric weather-engineering, invokes principles that are hard for the conventionally trained mind to accept. The technology is low-tech; point some hollow metal pipes at the sky and connect their lower ends into running water. But unless you know both meteorology and orgonamy, please don't try this at home, on our planet. In the late 1920s Royal Raymond Rife of San Diego invented a high-magnification, high-resolution light microscope. This meant that he could see unstained living cells, unlike the dead specimens seen under an electron microscope. Basically, he developed an electromagnetic frequency generator which he could tune to the natural frequency of the micro-organism under study. Further, he learned that certain electromagnetic frequencies could kill specific bacterial forms. New discoveries in biophysics not only shed light on the illumination process of Rife's microscope, they also explain how he could selectively explode viruses. His concept of shape changing bacteria indicates that traditional germ-theory dogma is incomplete. Despite documented cures, his non-drug,painless electrical treatment of diseases was not welcomed by a powerful medical union. When Patrick Flanagan was a teenager in the early 1960s, Life magazine listed him as one of the top scientists in the world. Among his inventions was the Neurophone, an electronic instrument that can program suggestions into a person directly through skin contact. He made the first Neurophone at age fourteen, out of kitchen junk, his electrodes were scouring pads made of fine copper wire and-insulated with plastic bags. He then wired the electrodes to a special transformer attached to a Hi-Fi amplifier. Holding the pads on his temples, he could hear, inside his head, music from the amplifier. Later models automatically adjusted the signal to resonate with the human subject's skin as-part of a complex circuit. Patent officials said it was impossible for a sound to be heard clearly without vibrating bones or going through a crucial nerve of the ear, and refused for 12 years to patent it. The file was re-opened when a nerve-deaf employee at the patent office did hear with a Neurophone. At one time Flanagan researched man/dolphin language, on contracts with the U.S. Navy. This led to a 3-D holographic sound system that could place sounds in any location in space. He then perfected a Neurophone model which could be used for subliminal learning that would go into the brain's long-term memory banks. But after he sent in a patent application on a digital Neurophone, the Defense Intelligence Agency slapped on a Secrecy Order and he was unable to work on the device or talk to anyone about it for five years. This was discouraging, since the first patent took twelve years to get. Having helped certain deaf people to hear, Flanagan's next miracle could be to help the blind to see. All we have to do is stimulate the skin with the right signals. With public acceptance of inventions such as space-energy converters and super-learning devices, perhaps today's innovators will pull the establishment,kicking and scoffing, into a new world view before the 21st century. However,figure that there will always be experts to say Forget it: such things are impossible. More space-energy converters will be pictured in a book by Jeane Manning,forthcoming from Avery Publishing Group this winter.